1999 foal, 16hh. Cost 33,000 guineas as a yearling and trained by L. G. Cottrell. Won six races at 5-6f between 2yo to 4yo. 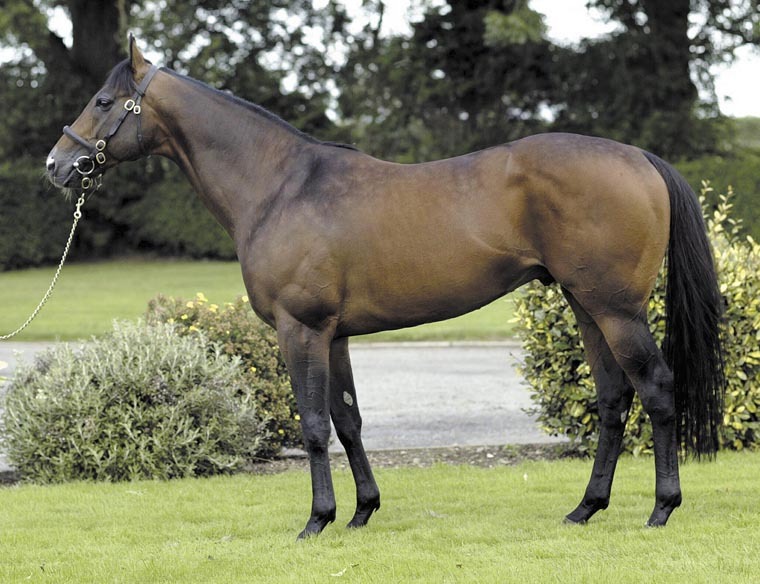 First season sire in 2007. Second on May 17th debut in a 5f maiden beaten 5L by Doc Holiday. Won three of his other 4 juvenile starts beginning with a 5f maiden at Sandown before being runner-up in the Listed Dragon Stakes at the same course (to Berk The Jerk). Successful in a 5f novice (from Old Blue Eyes) and then the valuable Doncaster St Leger Sales Race over 6f (from Old Blue Eyes & Captain Rio) to finish the year. Ran only twice at 3yo, both in late season over 6f, when placed in the Group 2 Diadem and a Listed race. Ran 9 times as a 4yo, 7 in Group 1 or 2 events. Won 6f conditions and a Listed race prior to success in the Group 2 Diadem Stakes. Finished his career with solid, but unplaced runs, in big fields for the Prix de L'Abbaye and 5f Grade 1 in Hong Kong in December. Stands at Rathbarry Stud in Ireland at a fee of €9,000. 69 yearlings offered at major European sales in 2006 with 60 selling for an average of just over 25,000 guineas and a median of 21,000gns. The first Group winning son of a sire who has made his name producing precocious, sprint, 2yos to have runners in Britain. Until Majestic Missile's Group success as an older horse in 2006 Acclamation's Diadem win was Royal Applause's only older Group winner in Europe. His dam was a Group 3 5f winner at 2yo and a half-sister has produced recent Group 2 5.5f winning 2yo in Never A Doubt. Made a notably good start with his first 2yos and finished as Champion First Season Sire and high up in the general lists. Got winners from early season and while most wins were at 5-6f (30 of them) the strikes rates at 7-8f were solid or better. One Group winner with Dark Angel who looked a sub-standard Group 1 victor and started at 20/1 for another Group 1 event after his top level success and then sent to stud as a 2yo.